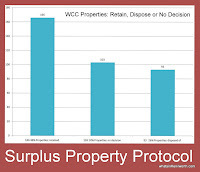 Item 12 on Thursday's Agenda is Surplus Property Protocol (19 pages). 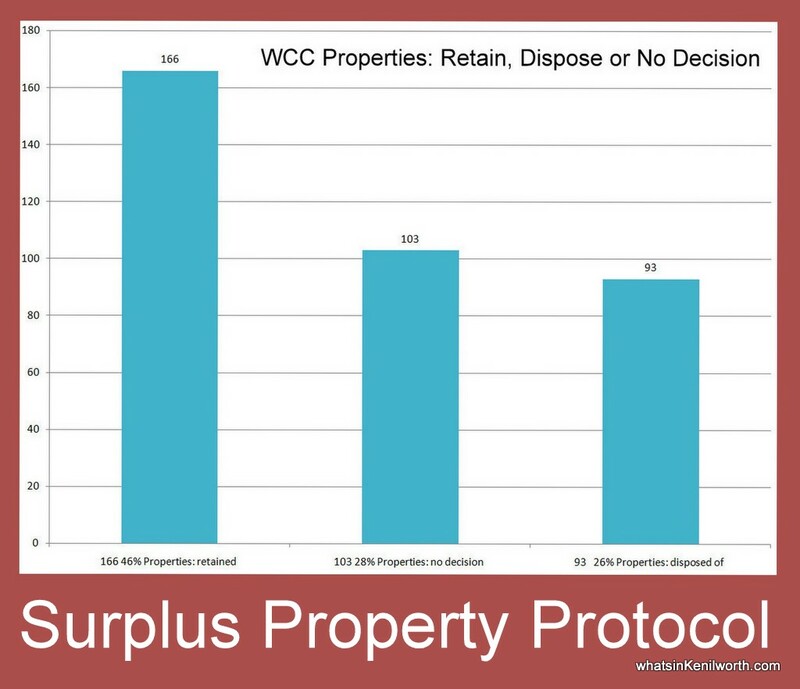 So, if a WCC property is surplus to the Council's requirements, it will be disposed of (sold or surrender/terminate a lease). Next step: will Cabinet Approve it (on 14 July). From the CORPORATE ASSET MANAGEMENT PLAN 2011 (118 pages): 1.3 The Council has set a challenging target of saving £4.376 m of running costs from its non-school assets by March 2014, and therefore our use of land and property is under scrutiny both within and outside the authority. And: This plan has been developed to set out the Council’s intentions for each of the approx 560 separate non-school assets which it owns or occupies. Assets are covered in the following order: 1. Offices, 2. Youth Centres, 3. Teaching & Learning Centres (PRU’s), 4. Children’s Centres, 5. Care Homes for Older People, 6. Community Support Service Centres, 7. Day Centres, 8. Group and Residential Homes, 9. Libraries, 10. Registrars, 11. Fire, 12. Highways Depots and Road Materials Stores, 13. Transport Bases, 14. Household Waste Recycling sites, 15. Heritage, 16. Business Centres, 17. Country Parks/Nature reserves, 18. Gypsy & Traveller sites, 19. Smallholdings, 20. Miscellaneous, 21. Assets leased to external bodies and 22. Surplus assets. NOTE: From my maths, this makes a total of 362 properties. That's what I counted from the document, so there are 198 missing (from 560) - I will read again and see if I can find them. Will update, know here they are get in touch. UPDATE: 14 July 2011, I've spoken with the report author who tells me, for example, there may be 75 Smallholdings and Farms. this may explain mismatch on numbers...still investigating.